Kyoto, also known as the old capital, reigned as the imperial capital of Japan for over a thousand years. So you can imagine a lot of history can be found there. It was also spared the worst of the bombings from World War II, something that couldn't be said about Hiroshima. 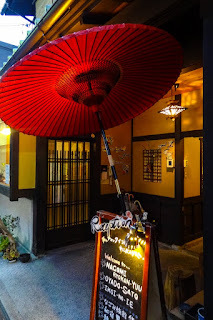 More national treasures of Japan exist in the city of Kyoto than any other and it remains one of the most important cities, culturally speaking, in Japan. 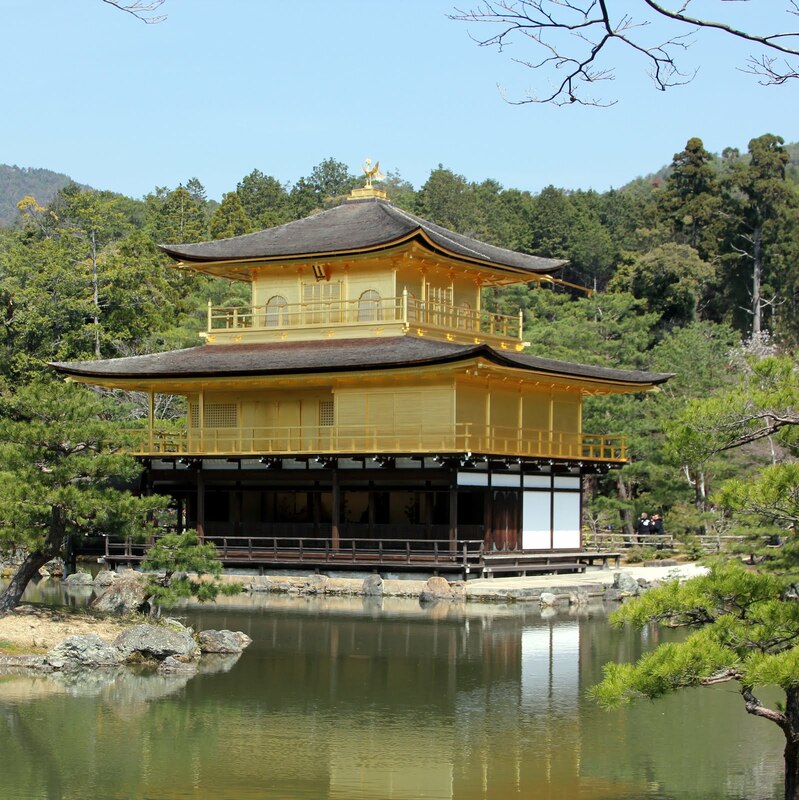 It's simply a must-visit place and was our next stop on our trek across Japan. 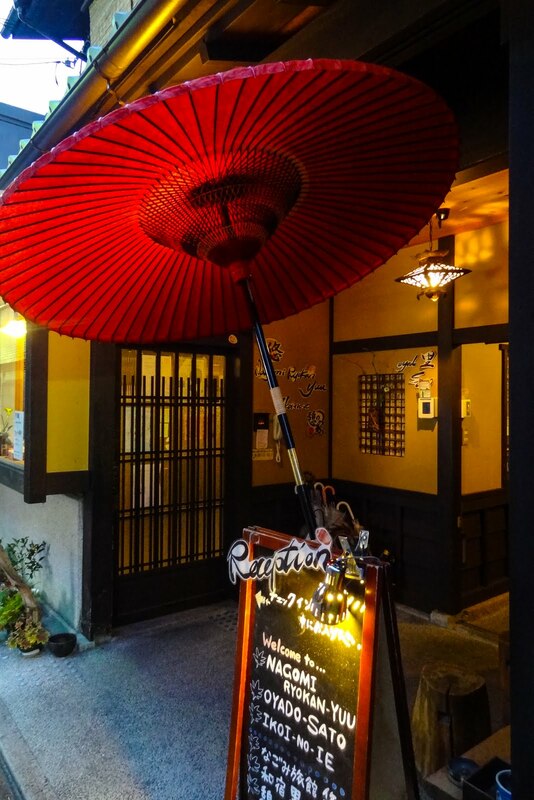 As one of the cultural and historical hubs of Japan, Kyoto boasts not only shrines and temples galore, but also some of the best fine dining you will find. 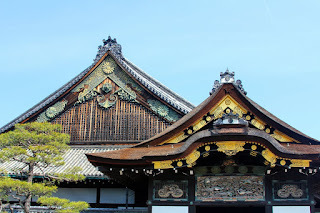 We toured the Nijo castle, the palace of the Tokugawa Shogunate which was not only gorgeous, but also included a fascinating architectural element: nightingale floors that sang like birds when you walked on them. These chirping floors were put in place so no assassins could sneak up on the shogun. They didn't allow photos inside so I encourage you to take a look at the wiki page! 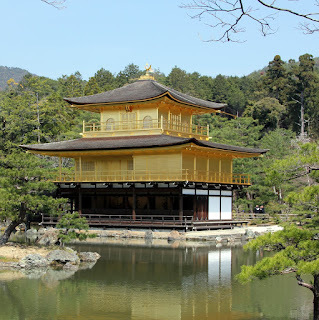 Probably one of the most famous sights of Japan featured at the top of this blog entry, Kinkaku-ji, the golden pavilion, was swarming with tourists both foreign and domestic. I have no clue how my mother managed to get a clear shot of it as I could barely see the damn thing across the water there were so many people crowded around the opposite shore. She hoisted her huge camera about her head like an homage to Say Anything and snapped this shot. While I feel bad disparaging something with that much gold leaf, I just didn't have any "wow" moment with this monument and honestly it looked exactly the same as the pictures. I think it was also because they don't allow anyone to get close to it. Rather than the temples and shrines of Fukuoka and Yawatahama, this was definitely a tourist stop rather than a religious experience. This green and orange one was stunning! By the time we reached Kiyomizu-dera, I was a little bored of grandiose architecture swarming with too many people and instead focused on people-watching, one of my favorite past-times. 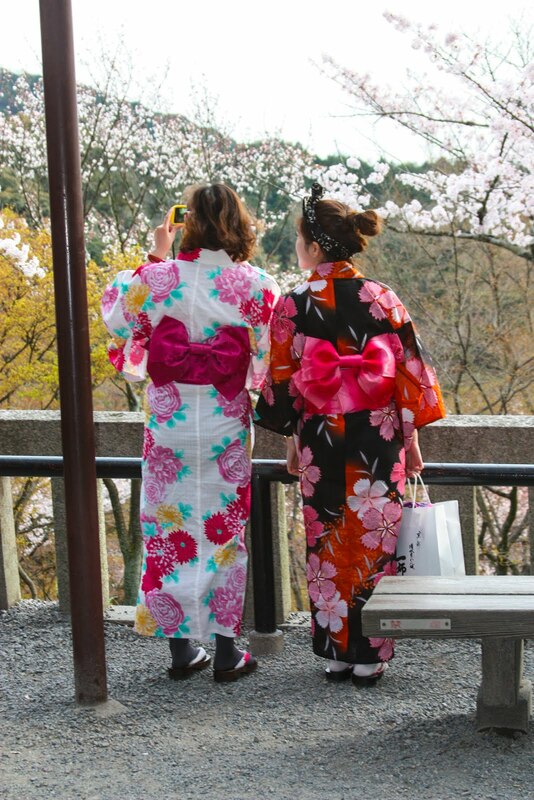 It was vacation time for a lot of native Japanese tourists, who were wearing yukatas for the cherry blossom pictures. 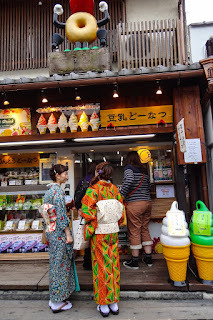 My favorite color is orange, so I tracked down a lot of orange yukatas for my own fashion inspiration (no I'm not kidding, check out the photos). A lot of the girls opted for pink, blue or purple, so I had my work cut out for me tracking down the orange ones. 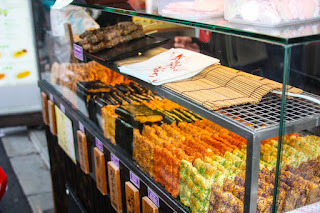 I also seriously enjoyed the street leading up to the temple, as it had snacks galore. 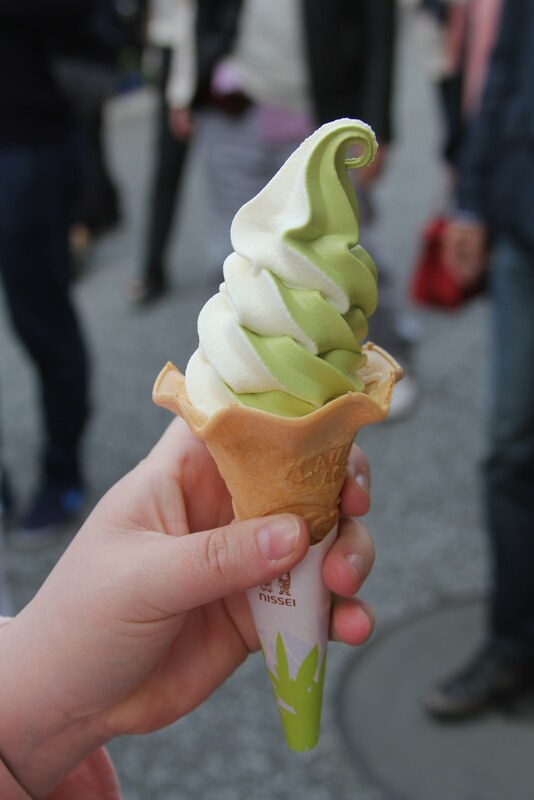 We tried some giant rice crackers and some delicious soft serve on the way back from the temple! 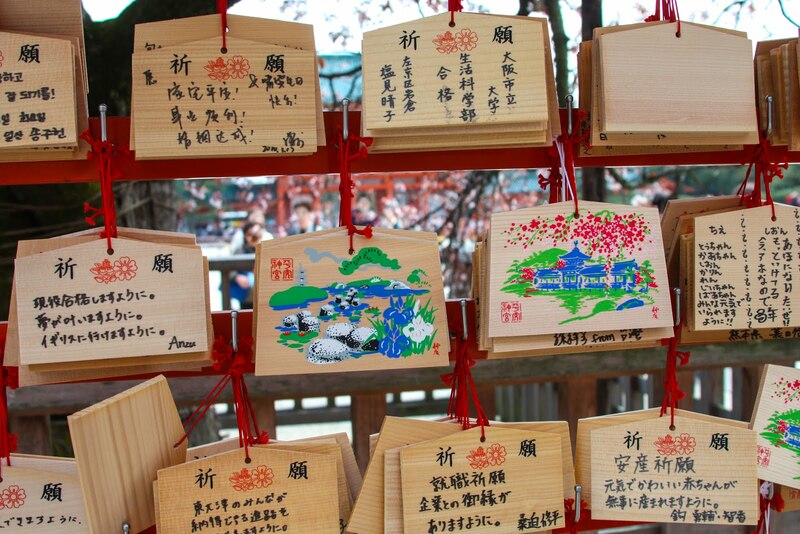 I feel the need to defend these shrines since I sound so unenthusiastic about them. They were awe-inspiring. They were gorgeous. They were huge and important. That's just not my deal. When we went to the imperial palace in Kyoto, my mother was bemused that I was more excited about the older tourists in their beautiful understated kimonos than I was the actual palace. I got goosebumps when I went inside of the local buddhist temple in Yawatahama and lit incense and found my ancestors. I loved wandering the markets of Fukuoka and later, Tokyo. I'm just not content to stare at a view: I like to touch, I want to explore, get lost, eat something funky, and do something spontaneous. One of the more spontaneous things we did on this trip was dress up as maiko, or apprentice geisha. 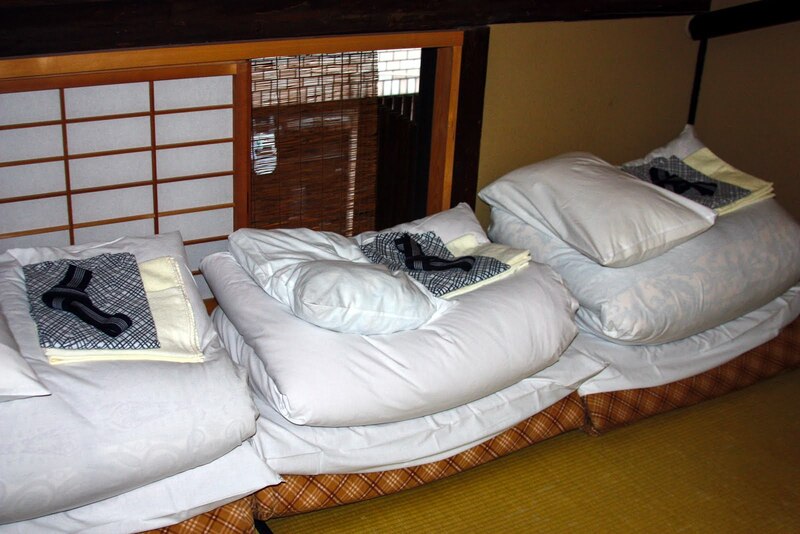 I saw an ad in the ryokan we were staying at, and had to try it. Apparently this is a very popular thing for Japanese girls to do when they visit Kyoto, and it was a very interesting industry. They had a veritable assembly line in a three story building to get us prepped, polished and dressed, before taking photos. 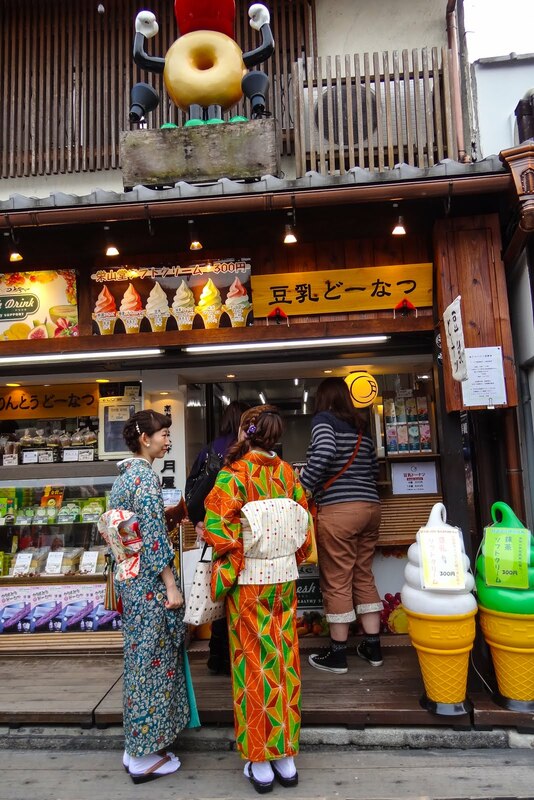 After strolling around in giant platform geta and taking photos outside, we returned where they restored us to street clothes and fresh faces just as fast. We were stunned. To see the results, see the first photo on this post! 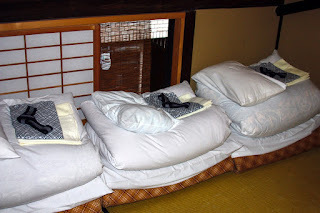 Rather than a modern hostel or a fancy hotel, we stayed in a very unique little ryokan situated in a renovated 100 year old machiya, or traditional Kyoto townhouse, called O-yado Sato. This machiya was made from earthen material, wood, and paper sliders and I fell instantly in love. It was located down a narrow street (too narrow for cars) paved with sakura-shaped stones, and the walls were green from green tea mixed into the clay! Staying in such an old fashioned house was a very fun and unique experience: our room was slanted from the roof, too low to stand by the windows, and we we woke up to the sounds of the neighbors getting their days started. It was an old world feel walking distance from everywhere. Our fluffy futons and the low side of the room! Kyoto is famous for its kaiseki ryori, which I was treated to back in Fukuoka, as well as the mackerel sushi I shared on my Ekiben post. Shojin Ryori, or vegetarian buddhist monk cuisine, is also very popular in Kyoto. I'll be talking more about Obanzai Ryori, traditional home cooking of Kyoto, when I talk about the cooking classes I took in Japan. 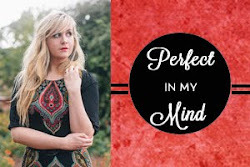 What will I be featuring for Kyoto? A restaurant review and some recipes! Stay tuned, or use the list below!